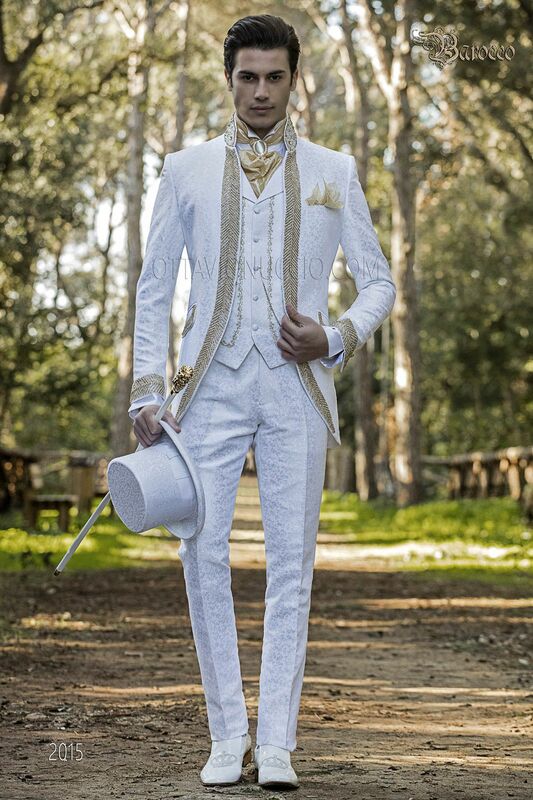 Waistcoat with lapel made from brocade white fabric with gold embroidery. White brocade waistcoat with vintage Baroque lapel. 5 covered tonal buttons and 2 double welt pockets. Golden floral emb... White brocade waistcoat with vintage Baroque lapel. 5 covered tonal buttons and 2 double welt pockets. Golden floral embroidery on the front and back lining with elastic band to adjust width. White satin shirt with wing collar and musketeer cuffs. Scarf and handkerchief set made from cream lace. Slippers made from white patent leather with gold-tone crown embroidery.